It's Secret Recipe Club time! Each month SRC members are assigned a blog to make a recipe from and then we all post on the same day. Who got who is a secret until reveal day, which happens to be today! This month I was assigned Flying on Jess Fuel, which has to be one of the best blog names ever. Jess is a navy wife and her blog is a fabulous collection of recipes shared from all over the US. Let me tell you I was really spoilt for choice this month. There were SO many recipes I wanted to make! Unfortunately I can't have any dairy while feeding my son as it upsets his little tummy, so that cut out a few awesome sounding recipes that I have bookmarked for later on - Jess's Taco Salad, Cheeseburger Pizza and White Chicken Lasagna to name a few. 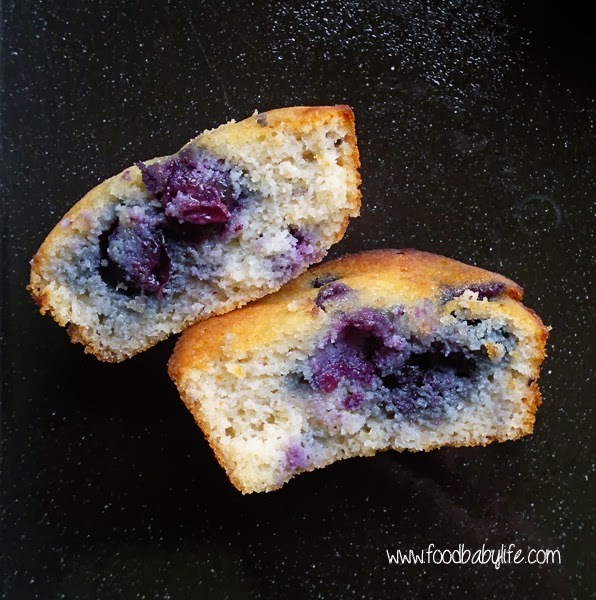 While browsing through her breakfast recipes I came across Jess's Coconut Flour Cherry Muffins. We happened to have a huge bag of coconut flour in the pantry and as I am trying to bake with less wheat and dairy this looked perfect! Coconut flour has become a really popular ingredient lately as it allows you to bake grain-free, perfect for anyone following a gluten free or paleo diet. It works very differently from other flours though so you can't just sub it one for one with other flours. For example, for every 1 cup of wheat flour you would use only 1/3 cup coconut flour and lots of extra liquid. I wasn't lucky enough to have a glut of cherries like Jess had when she made these, but I did have a bag of frozen blueberries so I used those instead. The only other changes I made were to use rice malt syrup as the sweetener instead of sugar, and olive oil instead of butter. So how did they taste? Delicious! 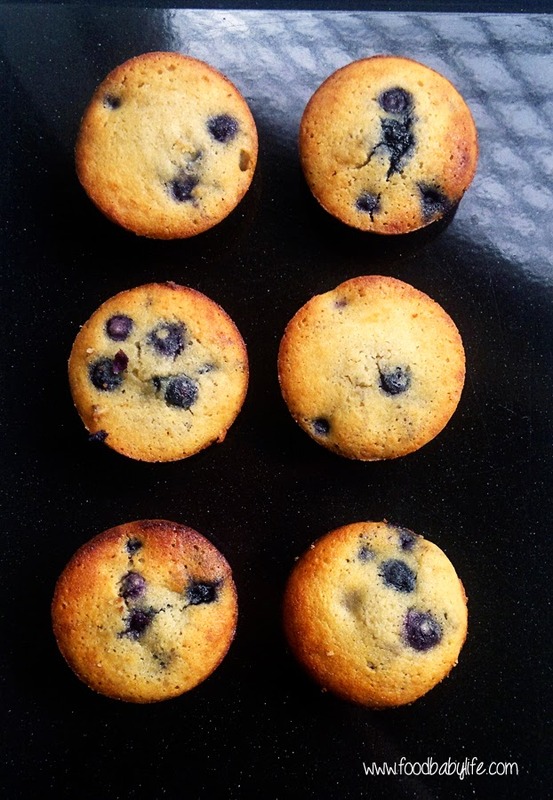 Slightly denser than regular muffins but very moist and with a very subtle coconut flavour. Similar to a friand made with ground almonds. These were a hit with my taste-testers and I've already made a second batch using pineapple and they were just as good. Preheat oven to 190 degrees Celsius. Grease a muffin tray and set aside. Add the dry ingredients to a large bowl and whisk to combine and remove any lumps. In a medium bowl, whisk together the eggs, oil, syrup and extract. Pour the wet ingredients into the dry and stir until smooth. Gently fold through the blueberries. Bake 16-20 minutes, until the edges are just beginning to brown and the muffins spring back when touched gently in the middle. Remove from the oven and leave to cool in the tin before turning out on to a cooling rack. Have never used coconut flour, but you are inspiring me to do so! I have wanted to bake with coconut flour for a long time. Looks like I need a bit more research before just jumping right in. Your muffins looks great! I've never tried using coconut flour (or gluten free for that matter). They do look delicious! It's always nice to have a recipe like that up one's sleeve. Lovely post and great pick! I've never used coconut flour before. Great pick! The muffins look amazing. Great pick this month! Thanks for the kind words and glad you liked this recipe!! I haven't baked with coconut flour in a while... I need to do it again! I'm so glad you chose this one! I have some coconut flour I've been wanting to try out! Pinning this right now to make them. Great SRC pick this month! !